My first impression of this phone was that it’s attractive looking, with a stylish cellphone style flip design. Opening/closing the phone and using the buttons is a bit creaky, and it feels as though the phone was cheaply made. Despite that, it’s working just fine and I haven’t had any problems with its physical functionality. The phone works much like a cellphone, with Send/End buttons, a standard dial pad, a 4-way navigation button and a few other buttons for various functionality. To place a call, you dial the number and press Send, just as you would with a cellphone. The phonebook application seems to work well enough. I’ve only entered a few names so far, but it’s fairly intuitive and isn’t very difficult to use. The phone supports sending/receiving e-mail, but it’s not very convenient. The display is much smaller than is practical for such things (the screen on my Treo is barely big enough). Typing in a message is a long and cumbersome process, since you have to press a key up to 8 times to get the particular character you want. There is also a speed dial function which I haven’t tried yet, and a call log. Along with some basic information such as statistics about the WiFi connection, firmware version, IP address etc., there are a few other tools which may come in handy for some people. Site Survey – This will show a list of nearby WiFi networks, with an asterisk denoting those that are closed (password protected). Ping – This will allow you to ping an arbitrary IP address. It sends four packets to the destination and reports the number of packets received. Detailed information (such as trip time) is not reported, so it’s really only good for checking to see if you have connectivity to a particular host. Restart – You can reboot the phone without having to turn it off and on. The phone can connect to the network using the 802.11b/g wireless protocols, with support for WEP, WPA, WPA2, AES and TKIP. You can have up to six wireless profiles configured, which is good if you only plan to use the phone in a few places. The phone will NOT automatically connect to an open WiFi network, so any time you move into a new network environment and want to use it, you’ll have to configure one of the profiles to use the new network – this makes it less than ideal for those who travel a lot and want to use their WiFi phone at hotels, airports, hotspots, etc. Up to six SIP accounts can be configured. I’ve successfully connected to a Trixbox I set up at home, as well as registering the phone directly with a VoIP provider. The phone supports STUN for those in a more restrictive NAT environment, but I haven’t needed to use it yet, so I can’t report on how well it works. Setting up the account in the phone takes a bit of time, but once all the information has been entered, it works quite well. This makes the phone MUCH easier to configure. Adding phone book entries and configuring SIP accounts becomes much simpler (and faster!) when using the web interface instead of the buttons on the phone. As always, REMEMBER TO CHANGE THE ADMIN PASSWORD! I’d love to update the firmware on this phone (it might fix a few bugs!) but as of this writing, they hadn’t released anything new yet. Those were essentially the “Pros” of the phone. Now for the “Cons”. As mentioned above, the phone has a cheap feel to it. It hasn’t broken on me (yet), but I always feel like it’s about to. The phone fails to keep itself registered to the SIP service if left idle too long. I was able to overcome this by setting it to reregister every 5 minutes, but that shouldn’t be necessary. The battery indicator is useless. It always shows full, unless it’s completely dead, in which case the phone becomes an expensive paperweight until recharged. Most hotspots require that you agree to their terms via a webpage, from the device you’re accessing the network with. Once you agree, their firewall/router will let most traffic through, but until then, you’re trapped inside their private net. 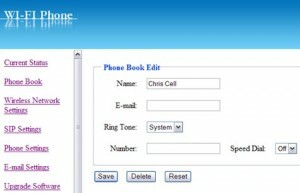 Since most VoIP phones don’t have a browser, there’s no way to do that. I had this problem at a hotel I was staying at, and was able to call the network provider and have them manually flip the switch for my phone to get out, but it was a big hassle and not really worth it. On subsequent trips, I just used my laptop and a softphone, which worked just as well, but I was of course tethered to the laptop when I needed to use it. I just bought the DPH-541, and it works fine for me from networks at home and at work which use Linksys WRT-54G wireless routers. I connect to an Asterisk box I set up myself at work. However, I am having problems connecting through public hotspots. The network connects – I get an ip address, but for some reason it doesn’t register with Asterisk. I am wondering if it is because they use two layers of NAT or if there is some kind of authentication they do that the phone can’t handle. When I can borrow a portable PC I will try to check this out more fully, but has anyone else noticed this problem? Hi, I was able to connect using WPA2 EAP or WPA2 PSK (AES) to my Linksys WRT54G v8 router without a problem. It did take several seconds to get in, but it did connect. Maybe your KEY was off by one character, or your settings didn’t match the phone/router settings. had to return it :The phone absolutely refuses to connect to a WPA2 EAP or WPA2 PSK (AES) network. DO NOT BUY THIS PHONE if you intend to use it on a WPA2 network. The latest firmware does not fix the problem. I have tried many different brands of router and many different networks. Other than the battery indicator, the phone worked well and gave good sound quality… but now I hear D-Link didn’t even make the phone… no wonder the Engineers there couldn’t tell me what battery charging chip was in there and if it’s faulty. … WOW!! … hey D-Link, don’t you make your OWN products anymore? The phone absolutely refuses to connect to a WPA2 EAP or WPA2 PSK (AES) network. DO NOT BUY THIS PHONE if you intend to use it on a WPA2 network. The latest firmware does not fix the problem. I have tried many different brands of router and many different networks. I don’t believe it can be used with any Skype service – they use a proprietary protocol and standard SIP phones won’t work. 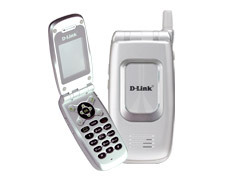 I also have a Tracfone as a last-resort backup. The VoIP service should be much cheaper, though, especially if you’re buying Tracfone time in small increments. The big difference of course is that the Tracfone is cellular while VoIP service tethers you to an IP network. If you’re interested in VoIP service, I use and recommend three different carriers. For residential service, I recommend Callcentric. For business service, I recommend Vitelity. I also use Les.net, but I don’t quite trust their reliability enough to give them a full recommendation for business service, and their interface isn’t user-friendly enough to recommend them for consumer grade residential service. Their prices are good, though, and it’s worth picking up a DID or three if you’re a techie type. When you say it requires a “valid VoIP Telephone Service Account” … is there any version of Skype that qualifies? Skype-out, Skype-in? So far all the VoIP services I’ve checked are just as expensive as a prepaid cell (I don’t really need all that many minutes per month). My TracFone cost about $100/year and I’ve got tons of minutes left after having it for three years. Thanks for the review. How’s the battery life? Battery isn’t great, but wouldn’t really expect it to be for a first generation device. 802.11 wasn’t designed to be power-friendly. To be honest, I don’t even know where the phone is anymore. I used it for a few weeks, but it was just too buggy to trust. It’d lose registration constantly… The only way I found to get around that was to have it re-register every five minutes AND turn the screen saver off, leaving the backlight on all the time – even more of a battery killer. Unless they’ve released new firmware with a lot of bugs fixed, or you don’t need to receive calls on it (the registration issue wasn’t a problem when making outgoing calls), I’d look at a newer model. It’s worth noting that my Linksys WIP300 has similar problems, but not nearly as bad. They both appear to be using the same hardware, by the way.